Rustfree western trucks from the 60's, 70's, and 80's. Your Rustfree Classic 4x4 Source! Bringing the "Best of the West" to the Midwest. We Can set the shipping up for you across the country, and world wide. 1973 Ford F100 1/2 ton long bed 4x4. This is a clean 100% rustfree western survivor, with only has 120k miles on it. This 4x4 has a strong smooth 360 with a recent valve job, nice shifting 4 speed, smooth clutch, power steering and power brakes. It also has factory A/C. 1987 Chevy Suburban V20 3/4ton 4x4. This Suburban is rustfree from California. It is a fully loaded, Top-of-the-Line Silverado model. It has a rebuilt 350 with .030 over pistons, and a firm shifting rebuilt TH400, A/C, Cruise, Tilt, PW, PDL, Bucket Seats, Class III hitch, Quad Front Shocks, skid plates, and 4.10 axle ratios, with a limited slip in the rear. it has a 4" professional lift with 33" BFG's. Hard to find 1979 Bronco with the desirable and rare 4 speed manual. 351, PS, PDB, AC. Freewheelin package. 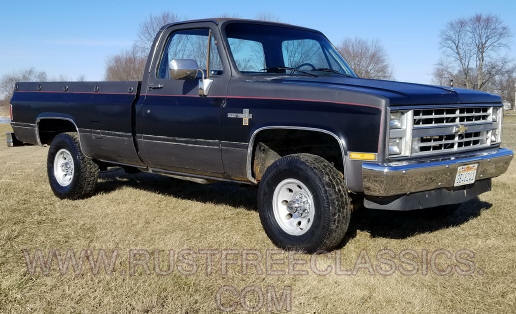 Rare 1980 Crewcab Dually 1 ton 4x4, 99% rustfree mostly original paint western survivor. Fully loaded Silverado for 1980. Rare square headlight trim, 350, TH400, A/C, Tilt, Cruise, etc. New BFG tires on stock wheels, new dual exhaust. Excellent driver! 1979 Ford Ranger XLT F350 1ton 4x4 SuperCab. Ranger XLT trim, 400 ci, 4 speed, A/C, etc. This is a clean 1 family owned 1/2 ton 4x4. It is 99.9% rustfree from California, and still has much of it's original paint. It only has 143,110 miles on it. It has a rebuilt 4.3 V6 with around 20k on it. It has a 4 speed manual and received a new clutch at the same time as the engine rebuild. This truck is almost fully loaded for a Scottsdale. It also has A/C, Dual Tanks, Tilt, Cruise, 3.73 axles with a limited slip rear, Skid plates, manual locking hubs, and a class III receiver style hitch. Another neat option is the factory alloy wheels that use the rally center caps. About the only options is doesn't have is PW and PDL. It even has the quad headlight package. It does have a nice sounding new Pioneer CD radio with remote control. The body and bed are pretty straight for it's age. It has a couple of dents, but isn't a beat work truck. This is a nice no excuses truck. I don't get many half ton long bed 4x4's. It is a nice clean example. This is a nice running and driving truck that I would hop in and drive anyplace. 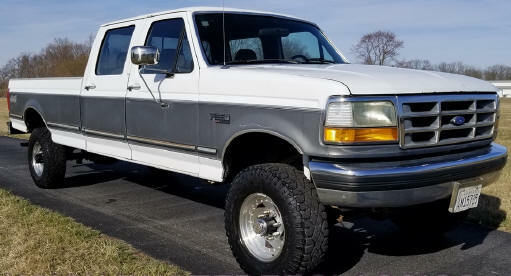 1989 F250 Super Cab 4x4, with the Top-Of-The-Line Lariat trim. 100% rustfree from California, with only 71,607 miles on the odometer. It is fully loaded bucket seats, PW, PDL, Cruise, Tilt, dual tanks, etc. It has real nice 33" BFG's, on nice chrome. Nice clean no excuses driver! 1978 F250 4x4 with fancy Ranger trim. Mostly original paint on 99% rustfree western truck. 460, A/T, PS, PDB, etc. I'm getting a lot of requests for regular cab 4x4's but I'm struggling to find them anymore. 1990 Bronco XLT, original paint on a 100% rustfree western survivor. Fully loaded, 302 V8, overdrive A/T, A/C, Cruise, PW, Tilt, etc. Clean bucket seat blue interior. It has nice working push button 4x4 also. This is an excellent driving turn key last of the Broncos. 1992 F350 Crew Cab 1 ton 4x4, with XLT trim. Rustfree western truck. Strong 460, overdrive A/T. PW, PDL, Cruise, Tilt, Dual tanks, Limited slip rear, Class III hitch, etc. Turn key driver at a good price. Rare 1 ton 1984 Dodge W350 "Power Ram" with the Top-of-the-Line "Royal SE" Trim, and "Prospector" off road packages. It is 100% Rustfree, and straight, and still has all of it's original paint, with only has 105k miles. It has a strong smooth 360 4 bbl, A/T, tilt, Cold A/C, 17" alloy Dodge wheels, etc. This is a unique fully loaded square body Dodge.